Book comments forthcoming, but for now.... Student-led discussions. Since mentioning that I had a moderate degree of success doing this last semester, I have heard from some friends who said that this approach had resulted in their own dumpster fires. OK, here's the thing... I get it. In my class, there were tangents, superficial comments, and words that just occupied space. This particular class was my favorite of anything that I have taught. Like, ever. In fifteen years. Because it was lively. Because it was fun. Because I heard REALLY smart things percolate up and redeem every, single banal remark. Because I liked my students. Because I still hear back from them about how much they enjoyed the class. I could go on. But I suppose that I should give some background. Because this particular course isn't like most of the courses that I teach. For starters, it was offered through our General Education department. We recently revised the curriculum and added a "capstone" course to be taken during the final year. Instructors have control over the topics and readings. 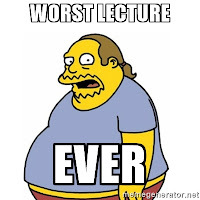 But we are asked to maximize interaction and minimize lectures. I took on this course knowing two things: 1) I stink at leading discussions. I just do. I have tried and tried and tried. But it's like dunking a basketball--no amount of plyometrics is going to get me there. I have limitations. And dunking and leading discussions are two of them (the other is MMA). And 2) the last time I tried something like this I HATED it. I mean, violently hated it. 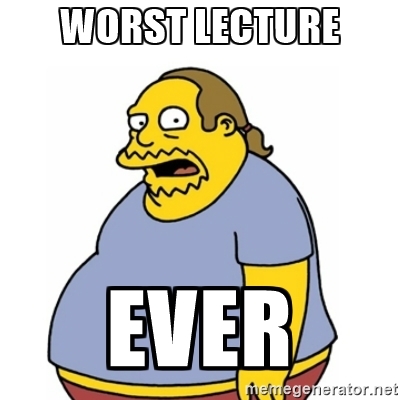 It was so bad that I went on a lecture binge for three years. "Oh, you want to discuss this material. Do it after class--I'm talking now. Bask in my intellectual awesomeness." Here I was, then, ready to dive back in to a setting where I knew I had limitations and a rough history. So I selected a topic that I thought would be of interest to most students, which led to the course title: "Radiation, Robots, and Viruses: The Apocalypse in American Film and Literature." The course met twice a week, and had days for watching films and preparing for essays. This left 15 class sessions for discussions. Now, most of the students taking this course (started with 20, ended with 15--so we had our own little apocalypse) had majors in business or health studies. Only two were from the humanities. Preparedness (4 points): Discussion leaders must demonstrate that they have read the material, and done additional research to assist with the conversation. They should also have a plan for how the discussion will progress and clearly-defined roles for each person in the group. Discussions must last a minimum of one hour, and they should be lively and entertaining the entire time. Participation of entire class (3 points): The discussion group must make every effort to involve everyone from the class. Discussion groups will not be held accountable if a participant is not prepared. However, the discussion group must make an effort to hear from everyone. Coverage of material (3 points): While going off topic is inevitable, the group must make every effort to cover the material and think about the key themes. 28-30 points: Participates in every discussion with more than one quality comment. If the student has an excused absence, he/she passes along a comment or comments to a colleague to be shared with the class. Or the student arranges with a fellow classmate to Skype in, or use a similar technology. Also, the student always demonstrates that he/she has read and understood the material. Put simply, this student’s comments stand out from the rest, and he/she can always be counted on for a quality insight. 25-27 points: Participates in every discussion with one quality comment. If the student has an excused absence, he/she passes along a comment or comments to a colleague to be shared with the class. Or the student arranges with a fellow classmate to Skype in, or use a similar technology. Also, the student always demonstrates that he/she has read and understood the material. 22-24 points: Participates in 90 percent of the discussions with at least one quality comment. If the student has an excused absence, he/she often passes along a comment to a colleague to be shared with the class. While often prepared for the discussions, this student has on 1 or 2 occasions shown to be unprepared. 21 and under: Rarely participates, and is unprepared more than 3 times. Generally a nonfactor in discussions. Or, has a lot to say, but nothing of substance. In other words, speaking a lot will not lead to full credit. Quite the opposite. I kept track of all of this while the discussion is happening. This system worked well enough. Also, throughout the semester, I would work at nudging conversations in one direction or another. In other words, I "coached up" my students on how to lead a conversation and on how to participate in one. Saying something in a group requires a degree of courage--you have to believe that you have something worth saying. Once we get to a place where that hesitation is minimized, we can work on making sure that our comments have substance. I have more to say on this, but I am currently over my :30 minute limit. So I'll close with a comparison. A few years ago, my wife and I started a Couch-to-5k program in Ebensburg. It was fantastically rewarding. We had anywhere from 40-60 people coming out, most of whom were not runners. Within eight weeks many of them went on to finish a 5k. Since their "graduation," some of our C25K participants have continued running. But most stop. While I would like everyone to continue running, I know that it's not realistic. What I do know is that every one of them had a transformative experience--they started something unsure that they could do it. But after some time and effort, they proved something to themselves. Something similar happened with my apocalypse class. I think that my frustration with the limitations of discussions stems from my own unrealistic expectations. I want classroom discussions to be exactly the same as the discussions that I have with my colleagues. That's not going to happen, just like my C25K runners weren't going to set course records on their first time out. But they grew in their own way. And I left every class meeting with a smile, and the assurance that Professor LecturesAlot won't be making his angry return.